Do you know the difference between fire dampers and fire smoke dampers? This is a questions that seems to come up a lot in the fire alarm install and design world. The definition of a damper is "A person or thing that damps or depresses". In other words it is a plate that is placed within the duct work of an HVAC system to regulate or in some cases stop air flow. Now in the fire alarm industry we are more concerned with the terms "Fire Damper", "Smoke Damper" or "Combination Smoke Fire Damper". Whats is the difference? Well it is actually quite simple as we explain below. A "Fire Damper" as defined in the CMC (California Mechanical Code) 2013 Edition Section 206.0 - "An automatic-closing metal assembly of one or more louvers, blades, slats or vanes that close upon detection of heat so as to restrict the passage of flame and is listed to the applicable recognized standard." The automatic means can be accomplished one of two ways: 1) by a fusible link that will melt upon heat thus releasing the louvers into the closed position. 2) by motorized actuators that will close upon loss or gain of power. These are typically controlled by and addressable relay module. A "Smoke Damper" as defined in the CMC (California Mechanical Code) 2013 Edition Section 206.0 - "A damper arranged to seal off airflow automatically through a part of an air duct system so as to restrict the passage of smoke and is listed to the applicable recognized standard." A "Combination Fire Smoke Damper" is exactly that, a combination of a "Fire Damper" and a "Smoke Damper". When are they required and how do I know when to use what type? Keep in mind that the fire alarm contractor will not be providing or installing these. However, it is nice to know what to look for on a bid set of plans or during a job walk. First up is the "Fire Damper". 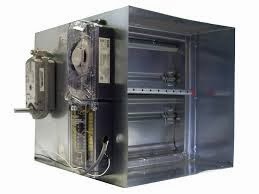 A fire damper is installed in HVAC duct work at the intersection of a rated barrier such as walls or partitions. The damper is in place to secure the integrity of the rated barrier in the event of heat or flames around 165 degrees F. Like we stated above, the fusible link will melt thus releasing the louvers on the damper. Once the louvers are closed or shut, the fire barrier is now secured from allowing flames to penetrate prior to the rating level of the barrier itself. Smoke dampers are similar however, they close in the presence of smoke. Now since the smoke damper cannot obviously sense smoke, we need to install a smoke detector. The smoke detector can either be a system smoke (tied to a building fire alarm system) or a stand alone smoke solely in place to activate the smoke damper. Smoke Dampers are required to be installed on walls that separate smoke barriers. What's a smoke barrier you ask...... A smoke barrier is a continuous surface such as a wall, floor, or ceiling constructed to restrict the movement of smoke. A smoke barrier can be either vertical or horizontal. Now a "combination smoke fire damper" is located in a situation where both fire rating and smoke barriers come into play. A combination fire smoke damper also needs a smoke detector just like the smoke damper. The smoke detector can either be a duct smoke detector (System Sensor D4120 or DNR) or a pendant mounted detector within the duct work itself. Once the detector senses smoke particles it will either through programming or local relay base close the damper louvers.